The city's biodiversity resides in iconic park lands like the Presidio, Twin Peaks, Glen Canyon, Lake Merced and Golden Gate Park. These places harbor a remarkable diversity of ecological communities of native habitats, plants and animals. The wetlands, prairies, dunes, oak woodlands and other wildlife habitats of our geographic area are part of the California Floristic Province, identified by Conservation International and the Nature Conservancy as a global biodiversity hotspot. Our local bioregion is recognized by the United Nations as the Golden Gate Biosphere Reserve. When the Yelamu Ohlone lived in the area we now call San Francisco, the northern peninsula looked very different from how it does today. The Ohlone thrived in the San Francisco Bay Area for thousands of years, living remarkably ecologically sustainably without using intensive agriculture as we know it. The Ohlone interacted with the land substantially through hunting, gathering, fire management and other cultural practices, and the ancient natural landscape retained its incomparable biodiversity among a striking variety of habitat and ecological communities, including dunes, coastal scrub, wetlands, ponds and lakes, creeks and estuaries, oak woodlands and riparian forests. The natural habitats that are described in this section are what remain of that ancient environment. Biodiversity, short for “biological diversity,” is the variety of interconnected species (flora, fauna, fungi, and bacteria) that have co-evolved into local ecological communities, ecosystems and processes of a particular place on Earth, plus, in cities, species imported from other places that contribute positively to vibrant and thriving dynamics of the remaining indigenous ecology of that city or town. Our city harbors dozens of rare and endangered plants and animals - birds, amphibians and insects - including over ten federally-listed endangered species! The Mission Blue Butterfly, California Red-Legged Frog and Western Snowy Plover are all endangered species that call San Francisco home. Our globally rare butterflies and plants are literaly found only in the San Francisco bioregion, and nowhere else on Earth. Download a PDF list of the over 20 species of globally rare plants of San Francisco. Despite our rich ecological legacy, our Franciscan bioregion is under severe pressure from our urban civilization. Invasive plants, insensitive land uses, institutional neglect, and lack of awareness and marginalization continue to erode the city’s biodiversity. Climate change is an emerging threat to the city's natural heritage. Combined with invasive species, climate change can cause accelerated stress on our natural ecosystems. In response to these pressures, many people and organizations work hard every week to steward our local natural landscape. Please visit the San Francisco Weed Management Area website for more information about invasive plant management. 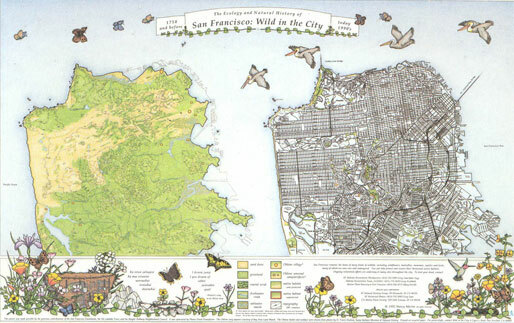 San Francisco was developed in a unique natural landscape, no less special than anywhere else on Earth. San Francisco, like other cities around the planet, has its own special ecological legacy, which deserves respect and protection just like the rainforests of Brazil or British Columbia. Around the world, people and policymakers have begun to acknowledge the importance of urban biodiversity, including the International Union for the Conservation of Nature (IUCN). In 2010, the United Nations Environment Program (UNEP) Convention on Biological Diversity (CBD) designated 2010-2020 the UN Decade on Biodiversity and adopted the UN Strategic Plan for Biodiversity 2011-2020 along with the 20 Aichi Biodiversity Targets. The CBD, the Stockholm Resilience Center and ICLEI-Local Governments for Sustainability published the Cities Biodiversity Outlook to help urban areas contribute to the 20 Aichi Targets. The Urban Biodiversity Hub is a comprehensive clearinghouse for information about urban biodiversity efforts around Planet Earth. And the Biophilic Cities Project organizes partner cities worldwide to share best practices and inspire action.